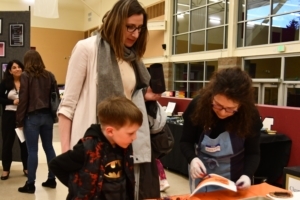 On March 26 and 27, 2019, more than 800 kids, parents, family members, and supporters turned out at Mercer Island High School for the annual Fine Arts Showcase. Thousands of artistic works were on display for two nights, with pieces and performances from students in every grade, plus interactive elements to engage guests in the creative process. Pottery, painting, sculpture, music, theater, jewelry making, and more demonstrated the depth of talent on the island. With such a large scale event that reaches so many people in so many different ways, it’s hard to deny the impact it has on and support it enjoys in the community. MICA is an organization committed to enriching the community on Mercer Island. MICA believes in the power of the arts and its ability to transform lives. Shared experience and exploration of the arts will help unite Mercer Island, creating a more culturally connected and vital community. MICA aspires to help build a community of positive, healthy, and active citizens and it is one of the main reasons we do the work we do at MICA. We all know that the intangibles of arts education can play an enormous role over the long term for both individuals and communities, which is why events like the Mercer Island School District Fine Arts Showcase are so important. 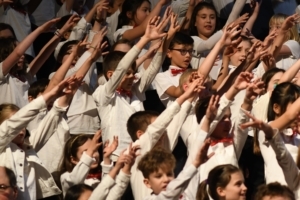 Recently, a study from the Brookings Institute and partly funded by the National Endowment for the Arts, shows a strong relationship between arts education and the development of upstanding community members. The study shows that arts students experience “a 3.6 percentage point reduction in disciplinary infractions, an improvement of 13 percent of a standard deviation in standardized writing scores (communication skills), and an increase of 8 percent of a standard deviation in their compassion for others.” Additional benefits include increased engagement at school, college aspirations, and the ability “to draw upon works of art as a means for empathizing with others.” These sorts of interpersonal skills are incredibly important in real life work and social situations. For many of the student artists at March’s showcase, The Mercer Island Center for the Arts will be a place to learn throughout their lives, to be a part of a thriving community, to experience new ideas and express their own, and continue to exhibit their work. maybe go on to show their work too. As the MISD expands the minds of students, MICA’s goal is to carry that spirit into adulthood, ensuring the lasting and ongoing contributions of talented islanders. And don’t just wait around for next year’s showcase; there are plenty of arts events happening on Mercer Island. Check out the arts calendar for new events every month.